A range of capabilities, at your service. Although our specialty is the automotive industry, our services can branch into a variety of other areas as well, including the appliance, agricultural and technical industries. At Kenosha Metal Products, we provide defect-free small to medium size stampings and assemblies, ranging from simple to more difficult undertakings— and we do so from start to finish. From evaluating designs and enhancing them for manufacturability, to working with trusted resources to correctly build tools for production, we cover every step to make sure your parts are always launched and then consistently delivered on time. 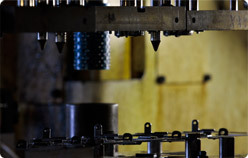 We produce brackets, shims and engine, transmission and brake system components. We manufacture Class 2 stampings from .020" thick to .250" thick. Kenosha Metal Products is also capable of producing shallow drawn components with a 2" to 5" draw. The materials we use include Cold Rolled Steel, HSLA Steel, 300 Series Stainless Steel, 400 Series Stainless Steel, Aluminum and HRP&O Steel. Of course, our capabilities aren’t limited to these materials and we are always willing to work with special requests. Our Flexible Automated Work Center is composed of six stations that can be reconfigured to create various products. This agility allows us to offer small assemblies with repeatable quality and much shorter set-up times at a lower cost. We also do secondary staking and welding. Our in-die tapping and staking capabilities allow us to offer customers lower-cost products along with improved quality by eliminating secondary operations. Using CATIA, we help customers create designs that are more cost-efficient and easier to manufacture. Our team can design on site, help make any needed alterations, and provide a quote based on those designs. We maintain all tooling in-house. However, when it comes to design and construction of new tooling, Kenosha Metal Products works only with resources that are as flexible and lean as we are. Drawing from their highly creative tooling expertise, these valued partners also take great pride in quality. At Kenosha Metal Products, we offer a World-Class level of quality. We fully understand the importance of FMEA, Control Plans and APQP and we use them extensively to insure the integrity of our production processes. We rely on a variety of systems and checkpoints before, during and after production for both prevention and detection of potential defects. Because of our attention to these quality processes, customers see a quality level that is among the very best in our industry. Using our EDI fed MRP system, we track production and delivery and measure success to make sure you’re always getting exactly what you need, when you need it.